The flag was posted on ebay and is glazed muslin, 29" x 50". Printed in red, blue, and black with canton bearing a spread-winged American eagle surmounted by a ribbon banner bearing Native American , the eagle holding a patriotic shield in its beak and flanked by stands of American flags, at its feet, a ballot box bearing the slogan Twenty-One Years. This device is surrounded by a medallion of 22 stars, with four additional stars in the corners. The fly has thirteen alternating red and white stripes with blue block-lettered text on second through fourth white stripes, which reads Native. 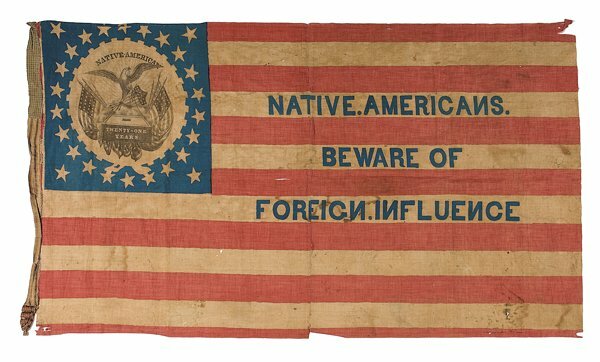 Americans./Beware Of/Foreign Influence, all the Ns are reversed, except the first N in Native. Hoist is hand-sewn homespun cotton of various colors. 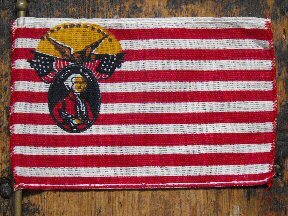 The Native American party was founded in 1841 at a state convention in Louisiana. Its general tenets were based on the philosophy that foreigners (and especially Irish Catholics) were anathema to the American existence. Party members adhered to the belief that foreigners should not be allowed to hold any office of public trust in the government, whether federal, state, or local. In 1854, the party adopted the policy that even United States citizenship should be granted only after an emigrant had lived in this country for 21 years -- thus the symbolism on this flag. A 4x6 inch stick flag which I got with a bunch of other historical U.S. flags. It has 16 red and white horizontal stripes with a white one on top. 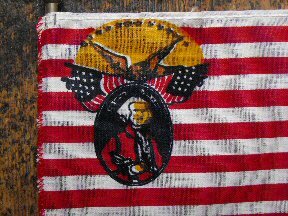 In the upper left corner is an image of George Washington in a red jacket holding a Sword with an eagle, 2 American flags/banners and 13 gold stars. This flag is from the American Bicentennial, released in 1975 by the Golden State Flag Company of San Francisco. This was their version of the "Know-Nothing" Flag. Attached is the picture and description from their pamphlet.